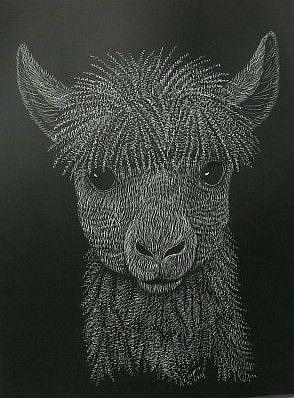 This scratchboard of an alpaca was my demo piece at the 2008 Nature Fest in the Cleveland Metroparks. It was done start to finish over the 2 day festival in between customers. The wavy lines are somewhat different than my usual technique, so that was a bit of a challenge. I've wanted to draw one of these animals for awhile, and was pleased at how it turned out.